Developer 343 Industries is looking to address Halo 5: Guardians aiming issues in a future update. 343’s studio head Josh Holmes said this on Twitter today. Following the release of Halo 5, fans have been reporting that aiming is anything from smooth. Others have report a “large deadzone” feeling. According the reporters, the issues weren’t apparent in the game’s beta. On the Halo Waypoint forums, user Smooth Jazz posts that, changing the thumb stick layout to anything except default, fixes the apparent smoothness issues. Saw Josh posting about the aiming in Halo 5 in response to some of your questions and figured it’d be a good time to lend some insight. That being said, yes, the aiming did change a little bit from Beta up until now. During the Beta, close-range gameplay felt fluid, mid-range felt decent, and long-range felt flat-out squirrelly. So, our Pro Team went through numerous tests over the course of a few months with our lead sandbox designer, Chris King, and the rest of his team in regards to how our how aim felt leading up to the release. There were some days where our entire team despised it, other days where our team had a split-decision, and finally one day where we all felt extremely comfortable with it. Now, to be fair, we’ve played this game for two years, so we do have a lot more time spent getting comfortable with the movement, as well as the weaponry. Nevertheless, like any other Halo player, we all know how good our shots are when it comes to a Halo utility weapon, and that day, we felt it. Thus, after careful tweaking, constant iteration, and daily discussion, we landed on our favorite fit. It gave players the perfect blend of sensitivity across all three ranges. Yes, close-range might feel a little bit harder to control at first, but in the long run, you will all learn to adjust to it for the better. Shooting the magnum in this game is very particular, seemingly like how Killer N or StK Tupac shot their pistols in Halo 1. At first, it’s going to be tough, but it will get much better with practice. Even to this day, shooting a Halo 1 pistol up-close is extremely challenging though, right? Furthermore, since the game is running at 60FPS, and the mobility is so fast in-game, I want to reiterate that everyone of us needs to adjust to how the aim-adhesion will feel for Halo 5. It’s a bit tricky at first – using a single-shot weapon to essentially swipe over an enemy as you pull the trigger feels different than before. 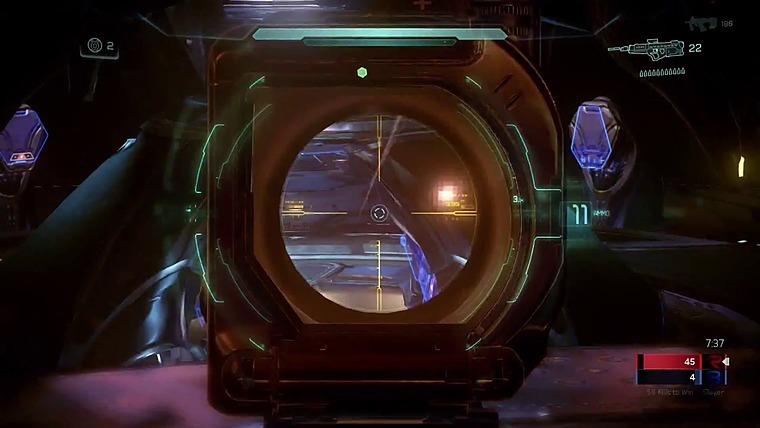 Also, in the Halo 5: Guardians Beta, a bug slipped through the cracks that had a delayed aim-assist problem. You could swipe your reticle over an opponent, and the game would display Red Reticle, but it was after a 5ms delay. Thankfully, we were able to address that issue and fix it before launch. So now, everything should feel very smooth. Nonetheless, we are actively listening to feedback, and we are always welcome to change. So, if players do feel this strongly about the aim after a few weeks, our teams will without a doubt revisit the sensitivity curves in Halo 5. On Twitter however, 343’s Josh Holmes has now acknowledged that, through testing, there seem to be some issues with specific Xbox One controllers. @JimmeeDubbs @Brav Through testing we've noticed this (slow aim) with specific controllers that have registration issues on the diagonals. According Holmes, these controllers have registration issues on the diagonals. @JimmeeDubbs @Brav Have you tried another controller? We are looking to address dead zone for problematic controllers in a future update. Holmes suggest trying out different controllers, and reassures fans that 343 is looking into addressing dead zone for problematic controllers in a future update. It seems that aiming problems will soon be fixed. Good news for those who have been experiencing issues.